Want an easy to make dinner tonight and delicious leftovers for lunch all week? 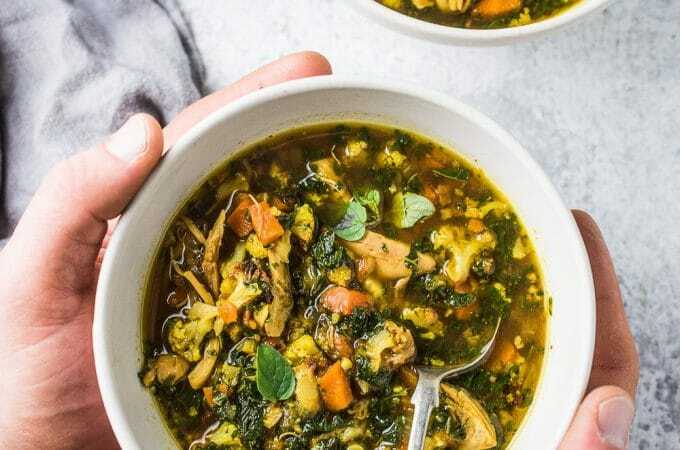 This healthy and delicious Curried Chicken Cauliflower Rice Soup recipe has your name on it. It's super simple to make and so flavorful. It's also paleo + Whole30 compliant. Dig in! In this season of all the parties and shopping and cookie baking and decorating, this soup is coming to your rescue. It's a gentle reminder to take it slow, enjoy the small things, and savor the moment. It's also a little welcome relief to all the pigging out on chocolate that's coming up. 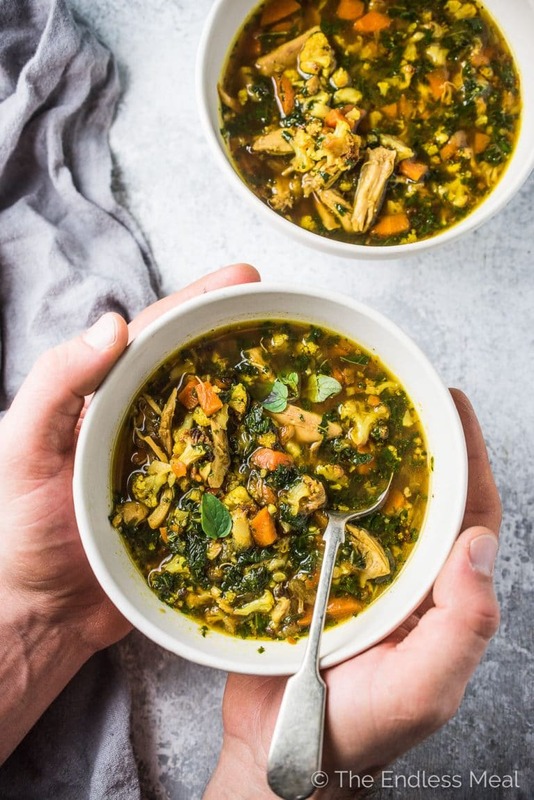 This chicken cauliflower rice soup is chock full of healthy and nutritious ingredients that will make your body happy. If you were following along when I did the takeover of the Whole30Recipes accounts on Instagram and Facebook the other week, you might remember that I shared this recipe there. After I shared it, I received tons of messages from people telling me how much they enjoyed it. 1. Bone-in chicken thighs. Always. 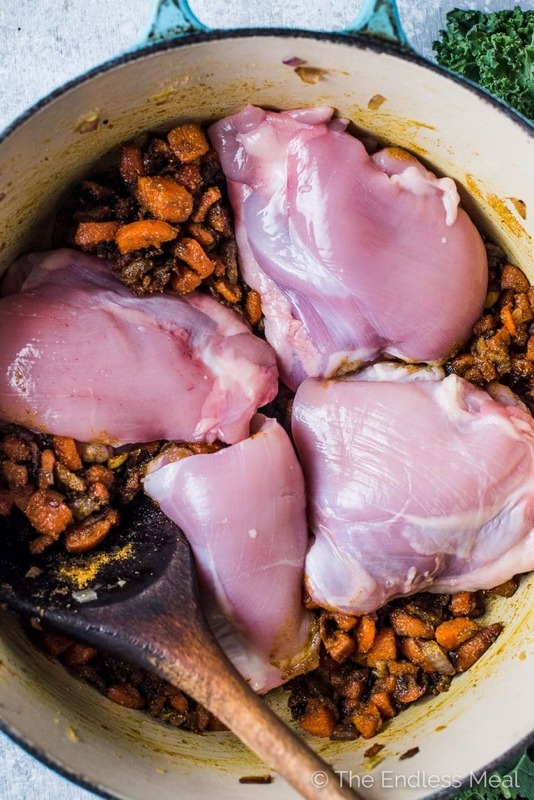 By cooking the chicken on the bone, the soup gets infused with tons of extra flavor. It's like making your own bone broth without the step of having to make it. 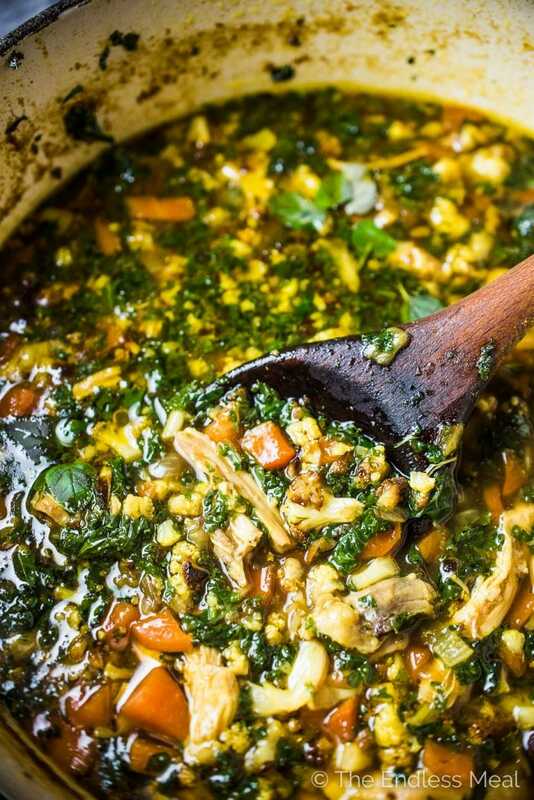 As the bones simmer in the soup, the chicken stock is made right along with your soup. I recommend doing this anytime you're making soup. And don't reserve this trick only for chicken. If you're making beef soup and don't have any homemade stock on hand, throw a couple of beef bones in the pot and voila! 2. Vital Proteins Collagen Peptides. This is a sneaky little trick that I absolutely love. 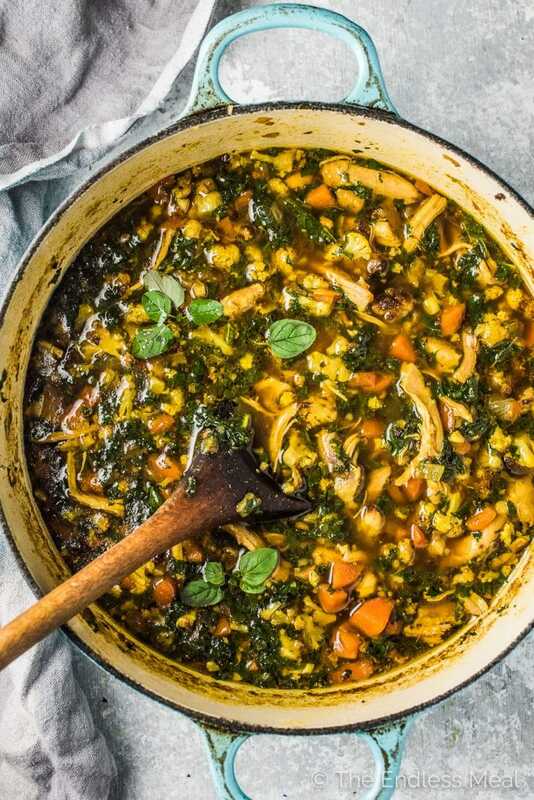 Besides being crazy healthy for you, the collagen peptides transform the flavor of this soup. It's a bit hard to wrap your head around, especially if you're familiar with Vital Proteins Collagen Peptides and know that they have almost no flavor. It's so flavorless that I add a scoop to coffee nearly every morning. But even though it has no flavor, adding a few scoops to the soup turns the broth into something rich and reminiscent of beef broth. ← It's magic. Now that you have those two magic tricks under your belt, the rest of the soup comes together really easily. I'm talking easy like saute, simmer, roast, stir, done. That's it. → Simmer with the chicken. → Shred the chicken then stir everything together. Done! See? I wasn't lying about it being easy. 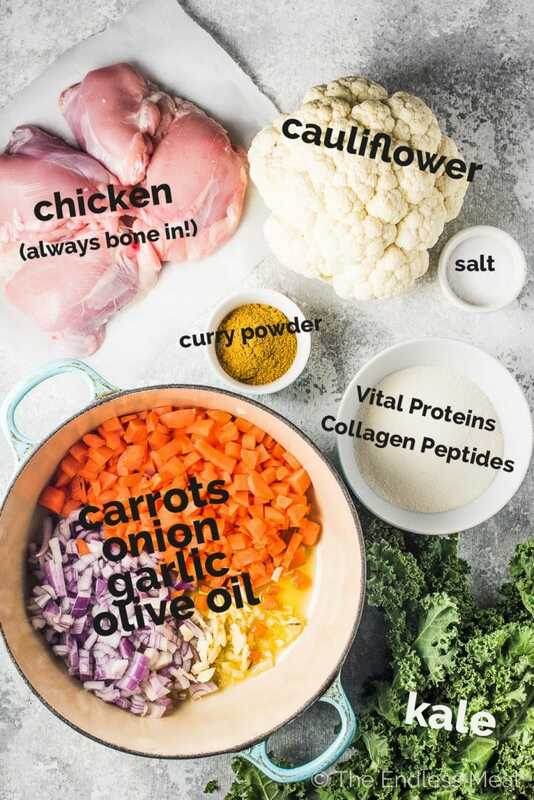 If you love this Curried Chicken Cauliflower Rice Soup as much as I do, don't forget to give it a 5-star rating in the comments below! Heat the oil in a large pot over medium-high heat. Add the onion, carrots, and garlic and cook for 6-7 minutes, or until they start to brown. Add the curry powder and sea salt to the pot and cook for 1 minute. Add the chicken and 6 cups of water to the pot and bring it to a boil. Reduce the heat to low, cover the pot, and simmer for 30 mins. While the onions are cooking, place the cauliflower on a baking sheet, drizzle with a little oil, and put it in the oven. Roast for 20 minutes, or until it is starting to turn brown. Remove and let it cool slightly. Chop it small so it is similar to rice. Remove the chicken from the pot and shred it using 2 forks. Add the meat back into the pot. Add the Vital Proteins, the chopped cauliflower, and the kale and cook for a few minutes for the kale to soften. This is a great soup. Phoned around to find the collagen peptides but not knowing if I’d like or use it again it was too expensive for me so I used a 2″x4″ strip of pork skin I keep in the freezer to produce an umami flavor to soup/stocks. It turned out wonderful even though I only had 1 large leaf of kale. I prefer a firmer vegetable bite to my soups so 10 minutes before shutting off heat I added another cup of med.chopped celery, onion & carrots. Another addition to this tasty soup was using my own frozen turkey stock. Thank-you for this far-em-out recipe, Kristen. Good call on the pork skin! I bet that added tons of flavor! This is the best soup ever! I made it once without Vital Proteins and it was really good. The next time I added the collagen and it was even better. Happy I made a double batch so I can eat it all week long! Isn’t it amazing how Vital Proteins changes the soup? I love using that trick in all my soups! I’ve made this at least 5 times in the last 2 months. It’s so delicious and makes for the perfect meal prep for thr week!! Does it matter what kind of curry you use? Which do you recommend? My current favorite is Primal Palate (https://www.primalpalate.com/organic-spices/#TOA) but any curry powder will work! How much water? I cant find it anywhere. We’ve made a few of your recipes lately and have really enjoyed them. This one turned out great. Thank you!